A panel of British lawmakers has submitted a request to visit former President Mohamed Morsi in detention since he was overthrown in 2013 by incumbent President who is seeking a second term in office. The group, made of the UK’s two leading parties, Conservative and Labor, reportedly wrote to Egypt’s UK ambassador to request a visit of Morsi who was toppled one year into his four-year term by current President Fattah al-Sisi, then defense Minister. The panel head, Crispin Blunt, from the Conservative Party, wrote the letter on behalf of Morsi’s family, which described the heath condition of the former leader very critical. The family members said they were allowed to visit their father only two times in four years. Morsi, in his detention at the Tora prison, according to the MPs and the family cited by media, is suffering from worsening diabetes, high blood pressure, loss of sight in one eye and other ailments, and is not receiving proper treatment. 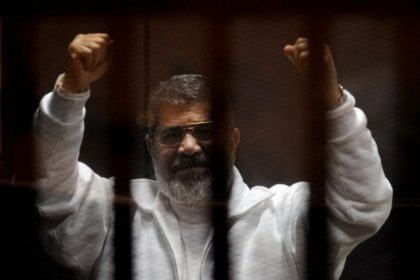 “His request for urgent medical treatment during a trial session was refused,” Morsi’s son Abdullah added in a statement. Locked up with dozens of other top members of the Muslim Brotherhood, Morsi is facing several charges ranging from use of unauthorized violence to crack down on protest, arrest and torture of protestors outside the presidential palace. The first democratically elected President also is sued for facilitating prison break in 2011 during the revolution. The coup leader and Morsi’s successor, al-Sisi, is currently seeking a second term in office in this month election void of suspense after all serious challengers have been forced or threatened to bow out. Al-Sisi is expected to win the polls against one candidate who many believe is bidding in view of saving the election. Blunt, a former chair of the Foreign Affairs Select Committee would be accompanied by Edward Faulks, a fellow Conservative and former justice minister, the London-based media notes. Labor’s Paul Williams, doctor by profession, and member of the health select committee is also on the team. Tim Moloney will be the bipartisan group’s lawyer to visit Morsi if the visit is allowed.